Some say breakfast is the most important meal of the day, and starting any cold morning off with a warm meal loaded with vitamins and protein is a great idea for aging adults. The staff at Home Care Assistance, a leading provider of at-home care in Guelph, has put together a list of hot and healthy breakfast options your elderly loved one can try. 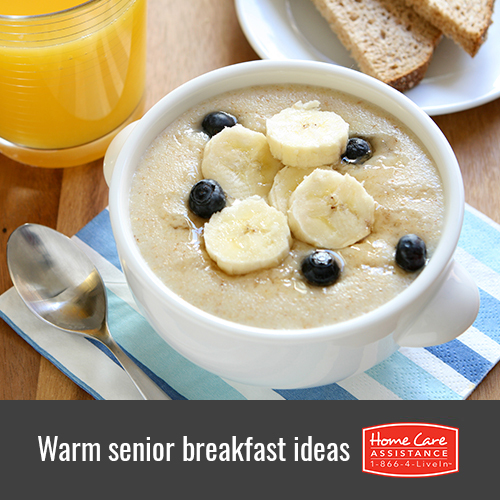 A bowl of piping hot oatmeal with some fresh or frozen berries is a great breakfast option for seniors. Oats are packed with dietary fiber and can help your loved one regulate blood sugar and keep cholesterol levels low. By adding some berries, he or she will also get a full dose of antioxidants, which help prevent cell damage and reduce the risk of many diseases and ailments. Whole-wheat toast is full of fiber and a great way to quickly boost your loved one’s energy. However, just as with many other food products, it is important to find bread that is free from dyes, extra sugar, and preservatives. As an alternative to peanut butter, which is often loaded with sodium and unhealthy fats, almond butter has a delicious taste and is packed with protein. A frittata is essentially a quiche that does not have a thick crust. This dish can be filled with almost any vegetable or protein source, including spinach, bell peppers, ground turkey, and sausage. Your loved one can either use the entire egg as the base for this dish or remove the yolk to lower the fat content. Depending on the vegetables and meats that are added, a frittata might contain fiber, zinc, iron, potassium, and vitamins A through K.
While quinoa is often cooked similarly to rice, it is actually a close relative to beets and chard. This healthy protein source can be added to almost any dish imaginable, but it is also a great option for a quick breakfast porridge. Many toppings can be used to accentuate the naturally nutty flavor of quinoa, including fresh fruit, honey, cinnamon, or even a dollop of yogurt. To learn more about senior nutrition, reach out to Home Care Assistance. Our caregivers can assist your loved one with grocery shopping and meal prep and also help with a wide array of other daily tasks. We also offer specialized Parkinson’s, stroke, and Alzheimer’s care Guelph seniors can rely on. Call one of our friendly Care Managers today at (519) 954-2111 to schedule a no-obligation consultation.